Geospatial Survey Solutions and Deri Jones & Associates (GSS & DJA) were approached by Cummins High performance centre in Daventry to carry out a 3D Laser scan of an engine test cell at their plant to assist with their continual improvement 6 Sigma project. With a throughput of some 25 engines per day, ranging from 'small' 8 cylinder units, through to large 16 cylinder engines used to power earth moving machinery, boats and generators, Cummins Daventry is a modern, efficient engineering plant. 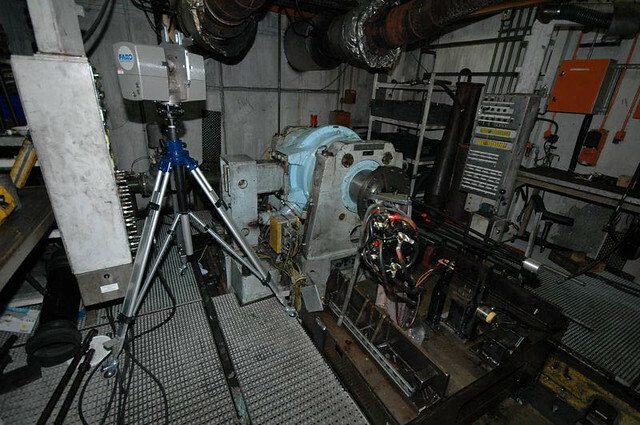 The 6 Sigma team at the plant continually research new methods to improve the quality and service of the engine test centre and identified large scale laser scanning using the Faro LS880 as a potential technology to produce accurate documentation for the test cells. DJA spent 6 hours onsite carrying a thorough survey of the site. With careful positioning of the scanner, we were able to capture much of the hidden detail of pipework and structural steelwork, including the detail of coolant pipes behind the cells dynometer. On return to the office, the LS880 scan files were cleaned an aligned using the reference spheres located in the cell and some basic sections taken to assist in the creation of a simple IGES CAD model of the cell. This model captured the location of the main structures in the cell and acted as a lightweight reference file for the Cummins design engineers to use.